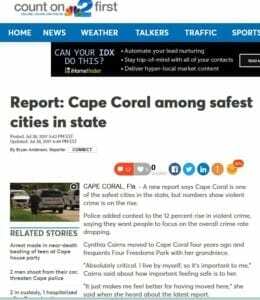 Per Florida Department of Law Enforcement and Local Police Statistics, Cape Coral safety ranks second in Florida. It’s possible there are web sites reporting relative stats, such as “higher crime than the prior year,” but everything is relative. An increase from 0 homicides to 4 is an increase, true. Again, all relative to prior year statistics. 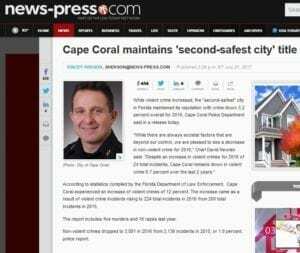 The “second safest city” rating for Cape Coral has been around for as long as we can remember. The year after year ranking illustrates consistency in the operations of the Cape Cops and consistency in local demographics. We notice also there are many “ranking” web sites that are using outdated information – charts or stats from 2012 for example. When researching, be sure to note the fine print on the statistical report’s dates.Also compare and contrast with cities of similar populations. Cape Coral is a large city by land mass (meaning spread out versus vertical towers) with 150,000+ residents mostly living in single family homes. 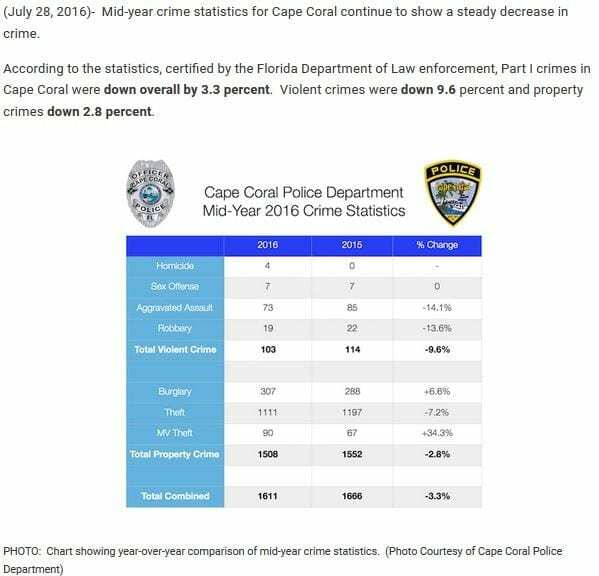 Below is a chart from the Cape Coral Police Department showing the mid year updated for 2016. We’ve compiled a list of third party resources from police departments, news organizations, and government that provide data and reporting on the quality of life in Cape Coral safety. Cape Royal is a golf course community of elegant single family homes. Homeowners can choose to join the Royal Tee golf club or they may simply enjoy the golf views without a membership. All homesites are oversized and have either a fairway or lake view. Low annual HOA fees are a bonus. Amenities include Clubhouse with a Grill and Lounge, Golf Course, Pro Shop, Tennis Courts, and 22 Lakes. View Cape Royal homes for sale. One of the reasons Southwest Florida is so popular for boaters is that there are endless destinations for day cruising, anchoring, or overnights at marinas. And of course, the aqua blue waters of the Gulf of Mexico, the white sand beaches, and the pristine waterfront and beach front parks are also cherished. We have compiled here a list of over 20 of our favorite boating destinations. 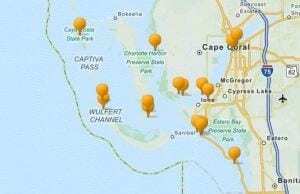 Click the map image to open a new tab with an interactive map of these places to go by boat in Southwest Florida. Oh, and all of these marinas, beaches, and restaurants, bars are most certainly just as fun to visit by car. The only location below that cannot be accessed by car is Cayo Costa State Park (there are ferry services to get you there). “While there are always societal factors that are beyond our control, we are pleased to see a decrease in non-violent crime for 2016,” Chief David Newlan said. Cynthia Cairns moved to Cape Coral four years ago and frequents Four Freedoms Park with her grandniece. “Absolutely critical. I live by myself, so it’s important to me,” Cairns said about how important feeling safe is to her. “It just makes me feel better for having moved here,” she said when she heard about the latest report. Cape Coral has an excellent crime rate, a lot of interesting local landmarks, and much lower housing costs than nearby Fort Myers. We have purchased, sold and purchased again from Dave and Brenda. Always treated us with care and respect. Worked hard to achieve pricing we were offering or asking. Great communication skills. Helped to keep us focused and on track to achieve the goal we had set. Have recommended to several friends who share the same experiences as we have. Highly recommend both Dave and Brenda to purchase or sell. 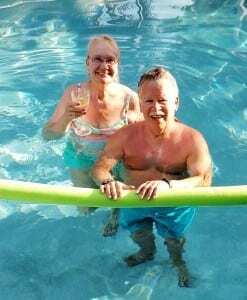 Ted and Carolyn turn their home buying experience in Cape Coral into a College class Case Study. Find out why. 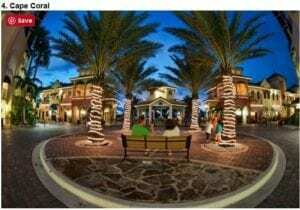 Cape Coral is Number 2 on their 2017 top 10 list of where people are moving in 2017.